Core the apples using an apple corer or melon baller. Don’t cut all the way to the bottom. The idea is to create a cavity for stuffing. We had to end up pulling the core out then cut 1/3 off the core end and placed it back into the bottom of the apple to hold the stuffing. Cream the butter and brown sugar together and Three Little Pigs Touch of Cherry . Beat in the cookie crumbs, cinnamon, nutmeg, and vanilla. Spoon the mixture into the apples. Stick a cinnamon stick upright through the filling of each apple and place a marshmallow on top. Cut sides down so marshmallow can seep inside. 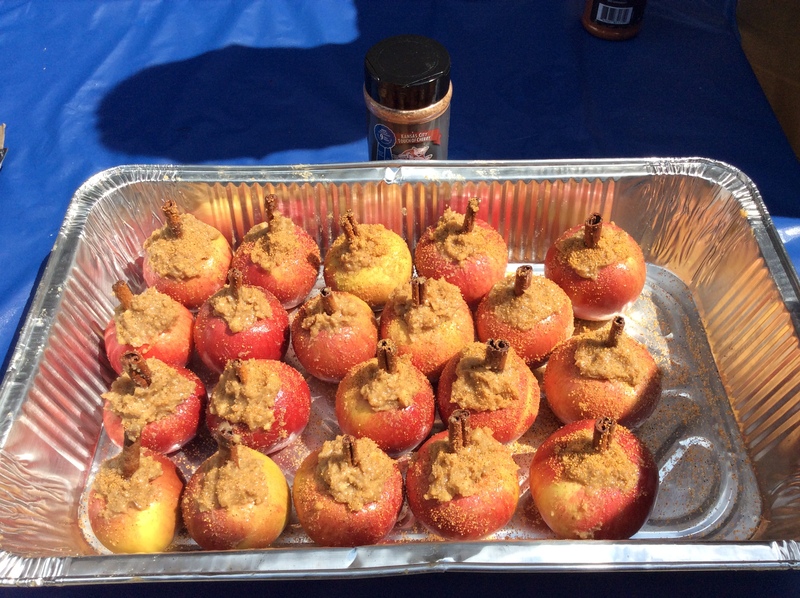 Place apples in an aluminum pan or on foil. Smoke apples until the sides are squeezably soft but not collapsing. 250 degrees for 1-1 ½ hours depending on size of apples. If the marshmallows start to brown too much, tent the apples with foil. This entry was posted in BBQ Classes, BBQ Tips, Meats, New Products, Recipes, Side Dishes and tagged 3 little pigs, America’s Best BBQ, apples, bar b que, barbecue, barbecue sauces, bbq grilling, Best BBQ rub, Best BBQ Sauce, Champ Rubs, Chris Marks BBQ, dry rubs for meat, fruit, Good One Smokers, great bbq rubs, grill barbecue, grill sauces, grilling, grilling sauce, Kansas City BBQ, meat rubs and sauces, Memphis BBQ, North Carolina BBQ, pork rub, rubs for grilling, smoke rub, smoked barbecue, smoked fruit, smoked meat, Three Little Pig's BBQ, Three Little Pig's Championship, Three Little Pigs Rubs, Three Little Pigs Touch of Cherry Rub, World Champion BBQ. Bookmark the permalink.